Two spellers have been declared co-champions of the Scripps National Spelling Bee. It was the first tie in 52 years. Indian-Americans Sriram Hathwar of New York and Ansun Sujoe of Texas shared the title Thursday after a riveting final-round duel. They nearly exhausted the 25 designated championship words. After they spelled a dozen words correctly in a row, they both were named champions. Their victories make it seven years in a row and 12 out of 16 that a speller of Indian descent has won. The run began in 1999 with Nupur Lala, who was featured in the documentary "Spellbound." Sriram, 14, opened the door to an upset by 13-year-old Ansun after he misspelled "corpsbruder," a close comrade. But Ansun was unable to take the title because he got "antigropelos," which means waterproof leggings, wrong. Sriram entered the final round as the favorite after finishing in third place last year. Ansun just missed the semifinals last year. They become the fourth co-champions in the bee's 89-year history and the first since 1962. "The competition was against the dictionary, not against each other," Sriram said after both were showered with confetti onstage. "I'm happy to share this trophy with him." Sriram backed up his status as the favorite by rarely looking flustered on stage. He nodded confidently as he outlasted 10 other spellers to set up the one-on-one duel with Ansun. The younger boy was more nervous and demonstrative, no more so than on the word that gave him a share of the title. It was "feuilleton," the features section of a European newspaper or magazine. "Ah, whatever!" Ansun said before beginning to spell the word as the stage lights turned red, signaling that he had 30 seconds left. Although they hoisted a single trophy together onstage, each will get one to take home, and each gets the champion's haul of more than $33,000 in cash and prizes. Gokul Venkatachalam of Missouri finished third and Ashwin Veeramani of Ohio was fourth. Critical thinking challenge: What skills do you learn by studying the spelling of peculiar words? Does Apple need Beats to stay cool? If you found $125,000, would you give it back? I would love to enter a spelling bee, but I cannot spell to save my life. That is a very lucky thing that both of the boys won the spelling bee. It would be cool to watch them compete. Anyone who can spell any of those words, is a god. These kids probably study their whole lives. I can't believe there was a tie. I think that this is a great way to split a tie, you just don't split it! I would probably never find myself doing a spelling bee competition. I am not that smart. Them people are probably really smart. The studying of spelling words right is by writing them down over and over again. If I do this it helps me remember how to spell the words. It is a good idea to when you get spelling words to write them down on a sheet of paper. when I would do this every night I would get better on my spelling tests. As one of the winners recently commented about the outcome of the spelling bee, "The competition is against the dictionary, not against each other." It's so unbelievable that such young people can be so intelligent and fair. The spelling bee sets a very good example for this generation., we should focus on filling our heads without knowledge because only good can come from it. 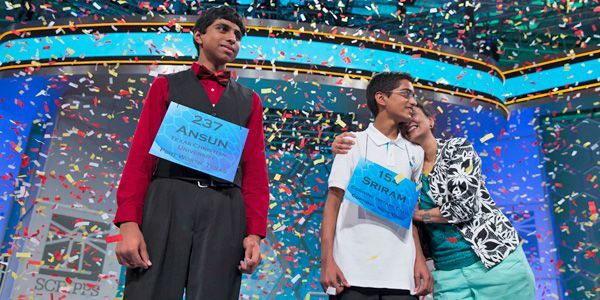 On Thursday in the Scripps National Spelling Bee, Sriram Hathwar and Ansun Sujoe both were co-champions. They were the first co-champions in 52 years. They were also the fourth co-champions in the bee's 89 year history. They spelled the 25 designated championship words and then after spelling 12 words correctly in a row. I think that it is really cool that they both won the championship and they seem really smart. This article is about the scripps national spelling bee. For the first time in 52 years the spelling bee ended in a tie. Two boys Sriram Hathwar and Ansun Sujoe shared the title. They spelled the 25 challenge words and they were the fourth co chamions. The bee has been going on for 89 years. Two boys from the midwestern US finished third and fourth. This is cool because two boys were co champs. i bet they worked very hard. This is really cool! I don't think I am a good enough speller to take part of a spelling bee. It probably took the two guys along time to prepare for the event. This article is about the scripps national spelling bee. For the first time in 52 years the spelling bee ended in a tie. Two boys Sriram Hathwar and Ansun Sujoe shared the title. They spelled the 25 challenge words and they were the fourth co-chamions. The bee has been going on for 89 years. Two boys from the midwestern US finished in 3rd place and finished in 4 place. USA! !